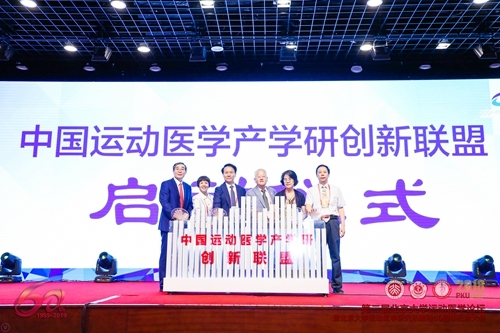 The opening ceremony of the Second Forum of Peking University Sports Medicine and Convention of the 60th Anniversary of Peking University Institute of Sports Medicine (PKUISM) announced the establishment of the Alliance of Industry-University-Research Innovation of China Sports Medicine (the Alliance). 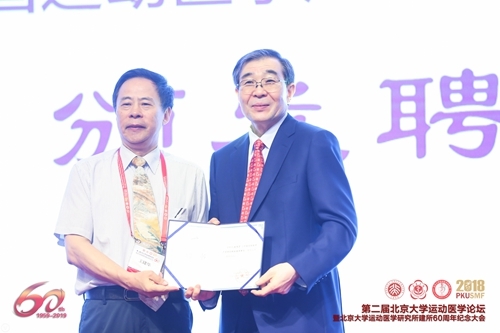 Wang Jianhua, Vice Executive Director of China Industry-University-Research Collaboration Association, awarded the letter of appointment as chairman to Ao Yingfang, Director of PKUISM. Director Wang commented the establishment of the Alliance was one of the key measures in promoting the leap-forward development of the whole industry of our country’s sports medicine. Depending on the four disciplines of sports traumatology, sports rehabilitation, sports nutrition, and medical inspection, and on PKUISM, China’s biggest, most influential and comprehensive institute in sports medicine, the Alliance will integrate medical care, teaching, researching and service, which is the best organization form to develop industry-university-research (IUR) innovation. He also expressed the hope that the Alliance will play a leading and innovative role in the profession. Ao Yingfang introduced that with the objective of promoting the technological innovation and industrialization of sports medicine, the core responsibility of the Alliance was to establish a resource sharing mechanism in upstream and downstream industry, IUR information, and intelligence property, and to establish a platform for the communication with the government, talent training, and international cooperation. The Alliance will also promote the establishment of a system of standard, evaluation, and quality control, the development of member organizations, and the integral competitive power of sports medical industry.